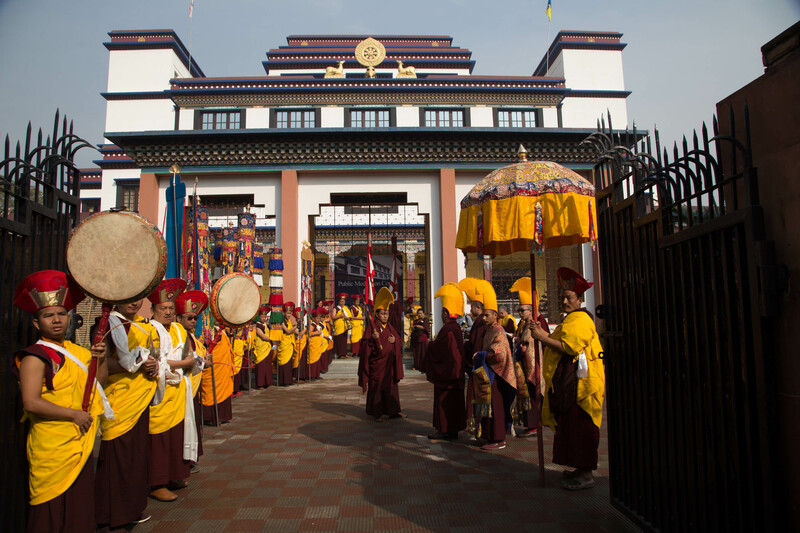 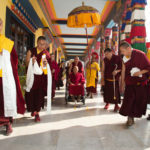 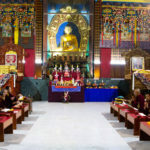 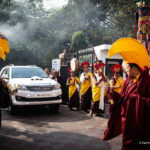 KIBI, 11 Jan 2019: At around 11:45 am, the monastic body of the Karma Kagyu saṅgha warmly greeted His Eminence Luding Khenchen Rinpoche with a traditional welcome procession at Karmapa International Buddhist Institute (KIBI), New Delhi. 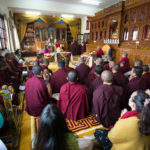 At approximately 1:30 pm, His Holiness the 17th Gyalwa Karmapa, Trinley Thaye Dorje, the supreme head of the Karma Kagyu Lineage, personally welcomed His Eminence Luding Khenchen Rinpoche to the Kunkyab Önang Khyilwa Hall. 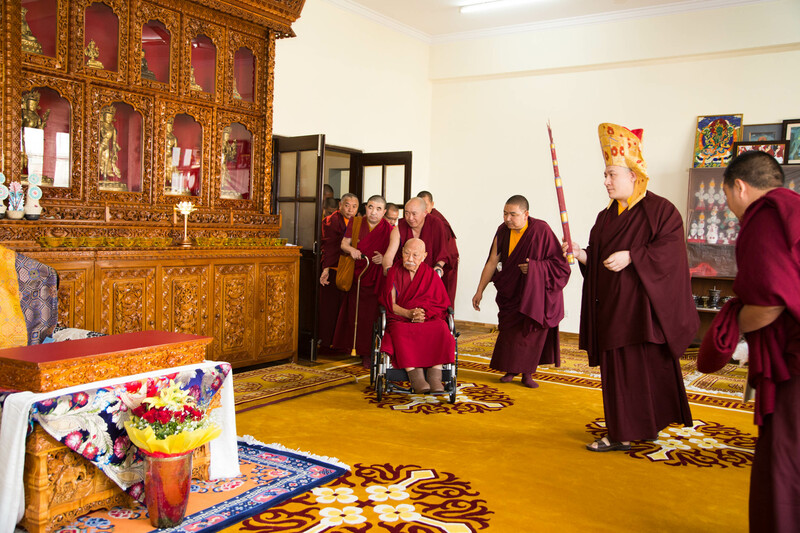 His Eminence Luding Khenchen Rinpoche lit the ceremonial lamp. 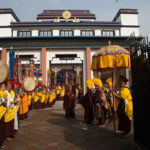 This was followed by the Sixteen Arhats Prayer (the saints who vowed to preserve the Dharma until the coming of Maitreya, the future Buddha). 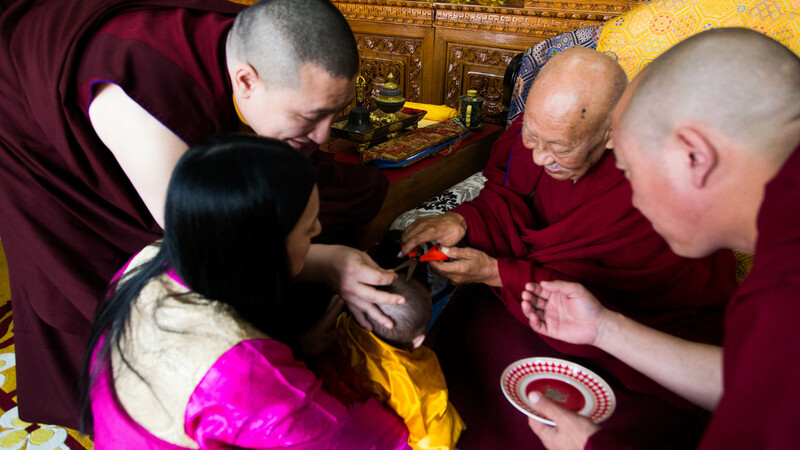 His Eminence Luding Khenchen Rinpoche then bestowed the Refuge Vow upon Thugsey-la (heart son) of Gyalwa Karmapa by performing the hair-cutting ceremony, which also included the conferral of the Dharma name ‘Jigme Chokyi Trinley’. 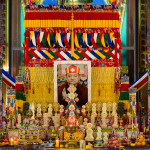 Gyalwa Karmapa was accompanied by his wife Sangyum-la Rinchen Yangzom. 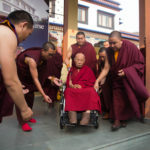 His Eminence Luding Khenchen Rinpoche greeted Thugsey-la in a very touching way, as though they knew each other already. 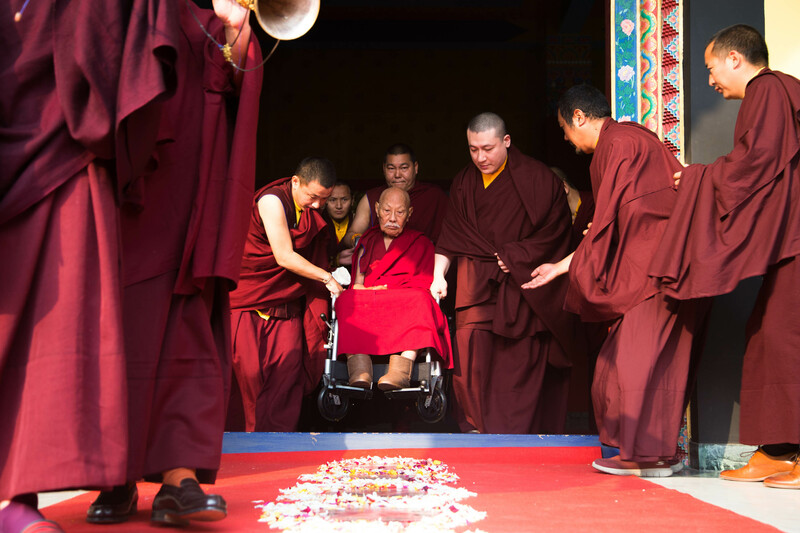 Those assembled who witnessed this powerful moment were deeply moved, each person having their individual way of experiencing this meeting. 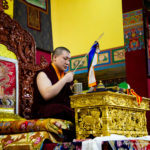 After that, His Holiness the 17th Gyalwa Karmapa performed a grand Maṇḍala offering – a symbolic offering of the entire universe and all its inhabitants – including the various substances symbolising enlightened activity, thus showing the utmost physical veneration. 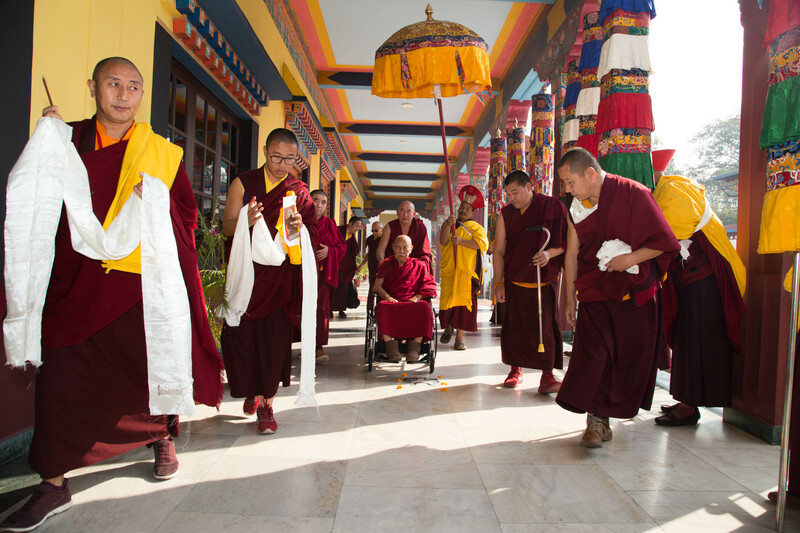 During this offering, the long-life prayer for His Eminence Luding Khenchen Rinpoche was chanted, paying deep gratitude to his immeasurable compassion. 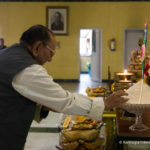 Ceremonial tea and saffron rice were served to mark the auspicious and historic nature of the occasion, followed by the conclusion prayers. 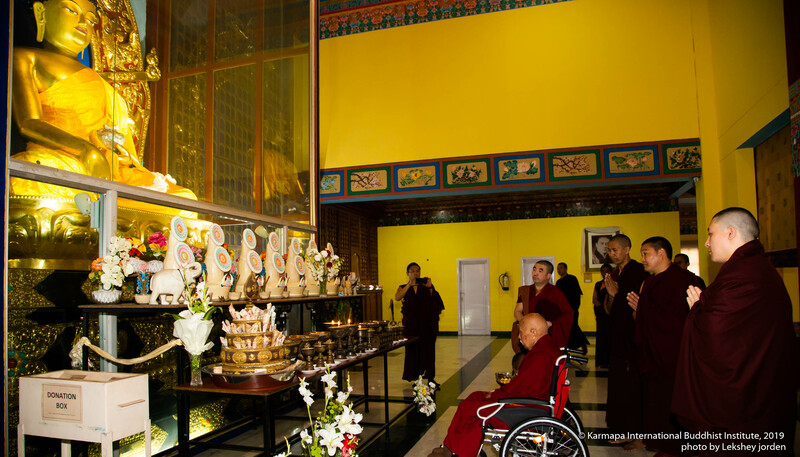 After that, His Eminence Luding Khenchen Rinpoche, with a heartwarming smile, kindly gave a blessing to all the devotees, followed by a photo session. 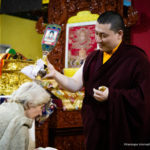 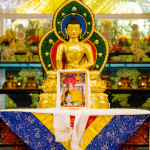 On his way out, His Eminence Luding Khenchen Rinpoche performed a consecration of KIBI’s main temple and lit a lamp in front of the Buddha statue. 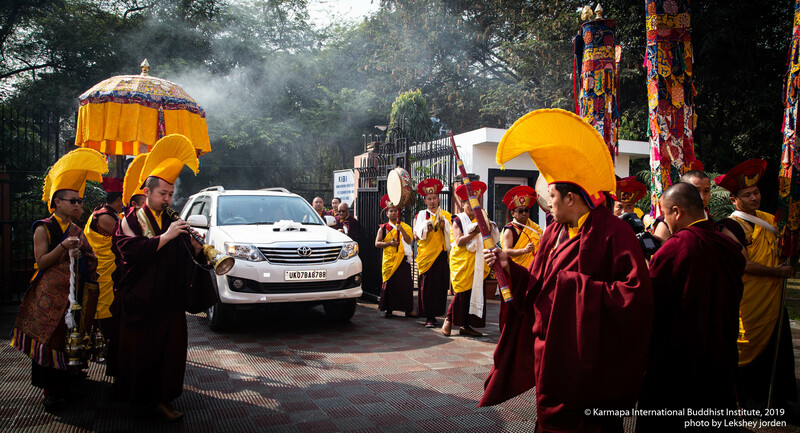 Finally, Karmapa and saṅgha accompanied His Eminence to his car, seeing him off with blissful hearts. 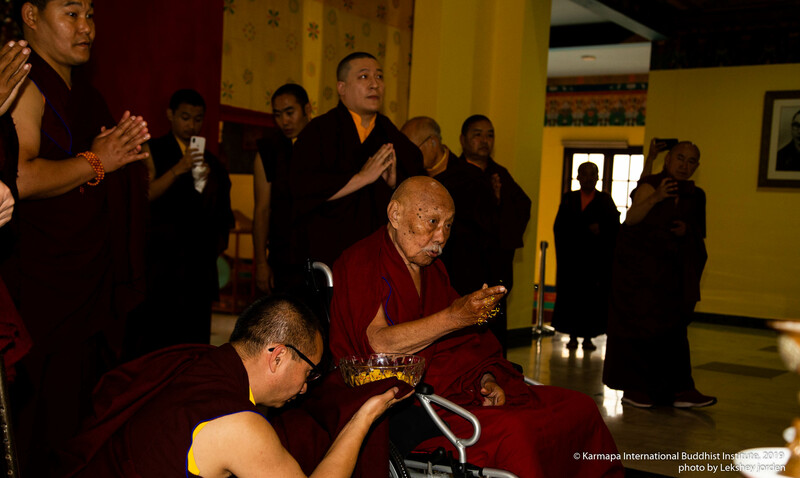 His Eminence Luding Khenchen Rinpoche has a special dharmic bond with the Gyalwa Karmapa and Shamarpa. 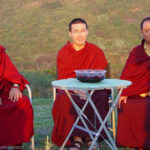 In 2003, Their Holinesses Karmapa Shamar-nag (the Black & Red Crown) received the rGyud sDe Kun bTus (the Compendium of Tantras, which was compiled by the 1st Jamgön Kongtrul Lodrö Thayé in the 19th century) empowerment from him in Menlo Park, California. 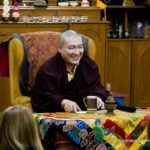 In 1961, the late Jamyang Khyentse Chökyi Lodrö (1893-1959) predicted that one day, Khenchen Rinpoche would transmit these teachings to the Kagyupas, which was also prophesied by the 1st Jamgön Kongtrul, even prior to that. 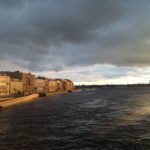 Thus the prophecies were fulfilled. 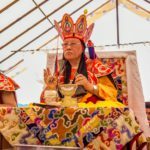 Subsequently, in 2014, His Eminence Luding Khenchen Rinpoche was one of the main Vajra- masters of the cremation ceremony (he conducted the Hevajra ritual) of His Holiness the 14th Gyalwa Shamarpa, Kunzig Mipham Chökyi Lodrö at Sharminub, Kathmandu. 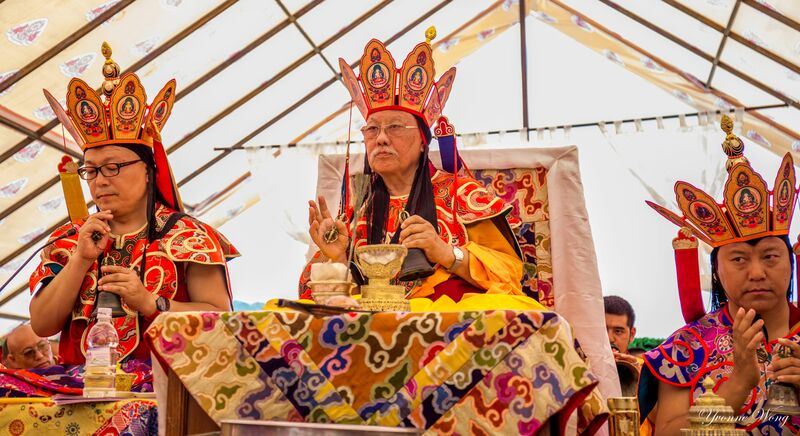 His Eminence Kyabje Dorje Chang Luding Khenchen, Jamyang Tenpei Nyima Rinpoche, is the 75th head of the Ngorpa tradition and the Vinaya vow lineage holder of the glorious Sakya School. 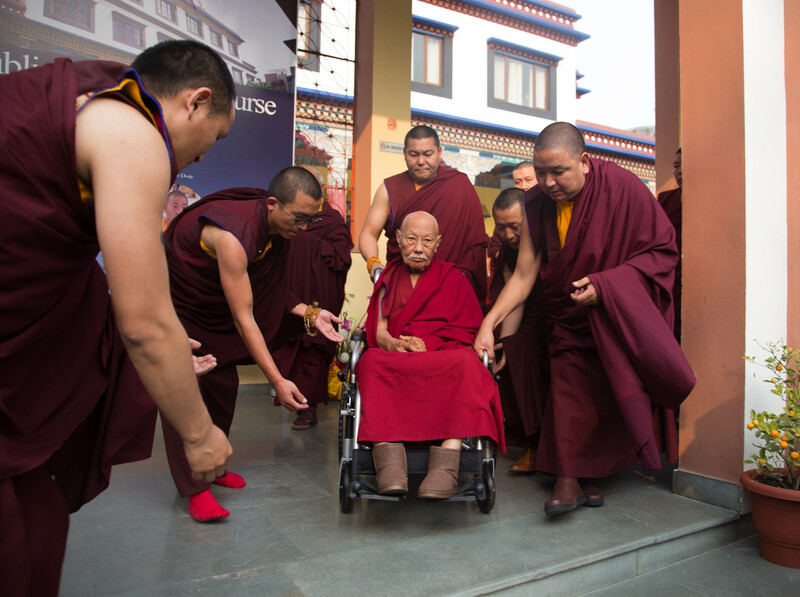 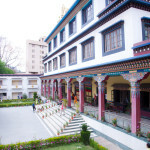 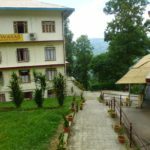 By now, at the age of 88, Rinpoche has dedicated his entire life to the Buddha Dharma, mainly bestowing teachings, empowerments, oral transmissions and re-establishing the summer rain retreats in most of the Sakya monasteries in India and Nepal. 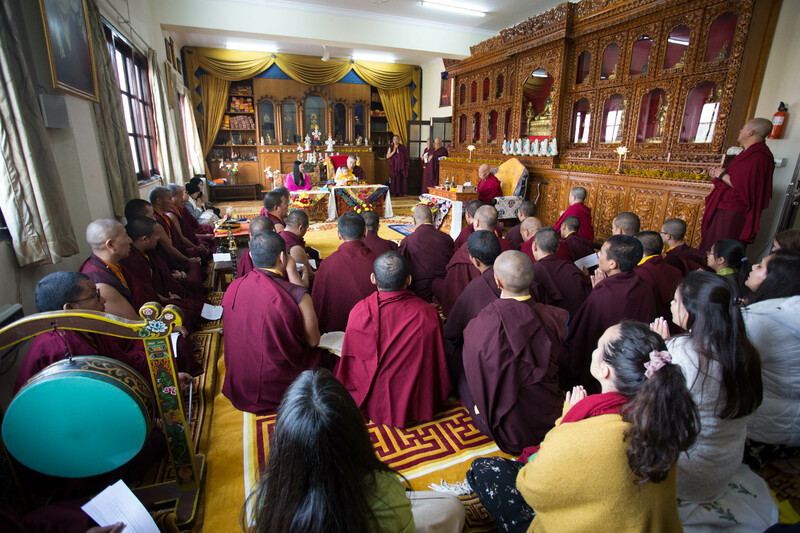 Public audience of His Holiness Gyalwa Karmapa’s heir and conclusion of the KIBI Meditation Course.